Here's the last batch of pictures of ALL the Furmans together. What beauties they are. Even though there's a great deal of diversity in this group, they still look like a little family, don't they? There's a little story behind this last picture of Oliver. Shortly before these pictures were taken, Oliver hopped into the shower with me and got a little soggy. He gave himself a post-shower bath, which left his brow all mussed up. Awww - they are all so adorable!! How the heck did you get them to line up on the sofa like that?? That Oliver! Such an adorable free spirit! I love that fourth picture where the other Furmans seem to simply accept Oliver dances to the tune of another drummer. Great pictures, Laurie! I am sure going to miss this crew, but I am thrilled they are going to wonderful homes. This was an exceptional batch of babies. Of course, I think that with every new group. I just love them all. Love the fourth photo from the top -- as Webthistle says, Oliver is always doing his own thing. What a funny little man. Such sweet faces, all of them. Have wonderful lives, kids! Don't forget to write! I'm with webbthistle! He just wants to dance! 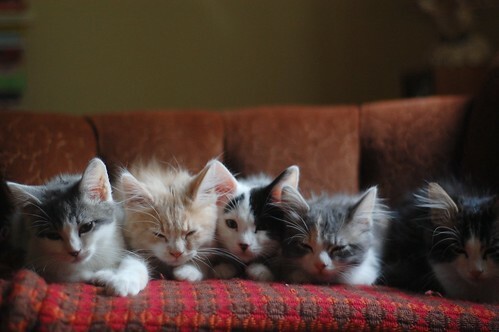 What a fluffy little bunch of cutie pies! They say "there's one in every family"...and I think in the case of the Furmans...it's Oliver. Hope we get LOTS of follow up pics of Oliver & Curtis! All adorable, those little furmen. So much ear floof! They are simply precious! kisses and hugs furry Furmans! Teddy has got to be the gentle-est soul ever. Love these babies with all my heart. Oh, those Furmans! Furmen? Furmanii? Whatever they're called, they're bundles of pure joy. Love the pile pictures, esp. the first one, where Oliver's getting his ear licked. Roland: "Ollie, buddy, let me get that ear for you". Roland: "Okay, you're fine, I'll get my paw and we're all good ready for more pictures." What a bunch of loves! I think Edith's expressions throughout have given me so many warm fuzzies. And that Oliver... what a character! 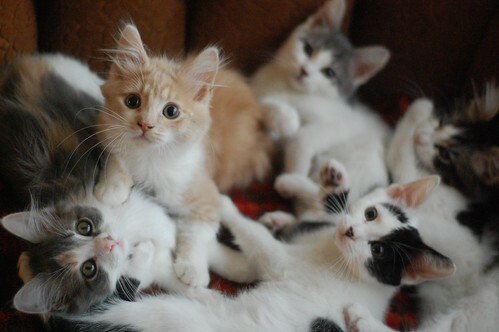 Love all the expressions on these precious kittehs! The water mark on Oliver's eyebrow gives him some disguishment. Oh, I love sweet little Roland, grooming his brother's ear! So, Laurie, did Oliver stay in the shower with you,, or did he hop right out as quickly as he hopped in? 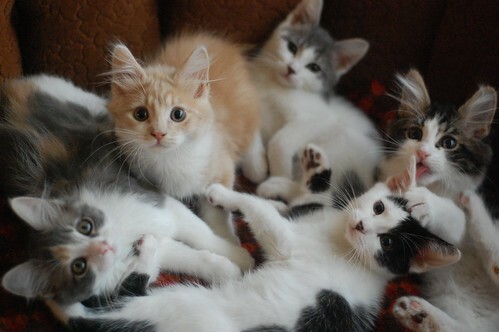 What a cute bunch of kittens, love the seal points. Hahaha, Oliver has given himself a punk hairstyle! Curtis always looks like he's asking for something and is anxiously waiting for your answer. I am going to miss those precious babies so much! They have really captured my heart. And yes, what a beautiful, playful little family! They always seemed particularly close. Love adorable Roland nomming on Oliver's ear! And wild boy Allover "doing his thing"! Curtis and Teddy are super-cute; I'm so happy they are staying together. 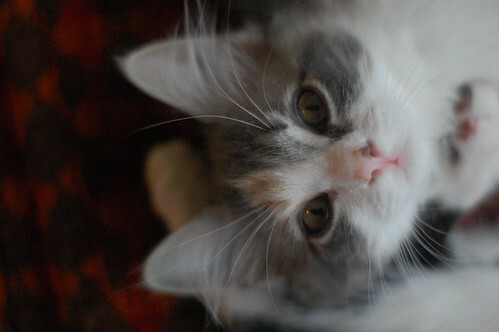 And, awww, that close-up of sweet Edith! *sniff* Bye, bye babies, goodbye! You and your floof will be missed, but so many wonderful adventures await you!! 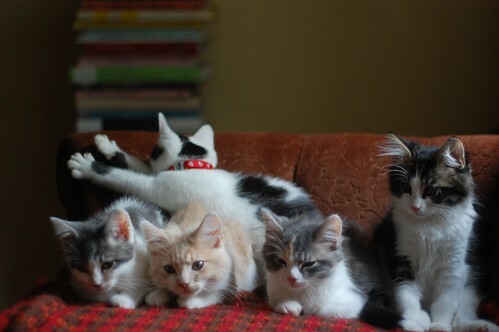 We never cease to be amazed at how yoo line up those cute lil kits for a photo session! And they look as cute as ever! 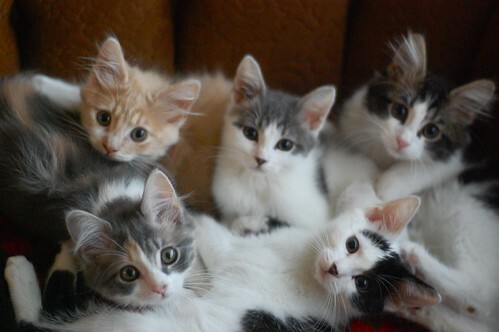 Aww, such a wonderful little crew of itty bitties. They'll be missed, though I've got no doubt their forever families are great and will spoil them rotten (as is a cat's right!). Is there likely to be another batch of kittens soon, or do you and Charlene need a break or has kitten season slowed to a virtual halt? I'm jealous of whoever is adopting Edith and Roland! 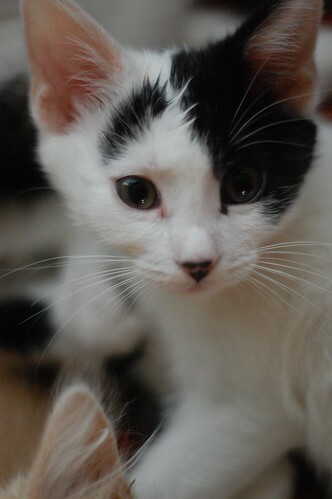 They're adorable fluffy kittens, and they're going to be beautiful fluffy cats. I want to pet and cuddle them! Ahh the ear floofies . . . missing them already. 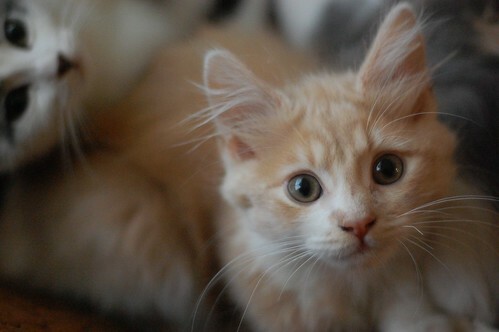 Oliver is in what we call "Super-kitten!" pose around our house. He'll save the day. LOVE THAT PHOTO! Love the super-kitten pose too!